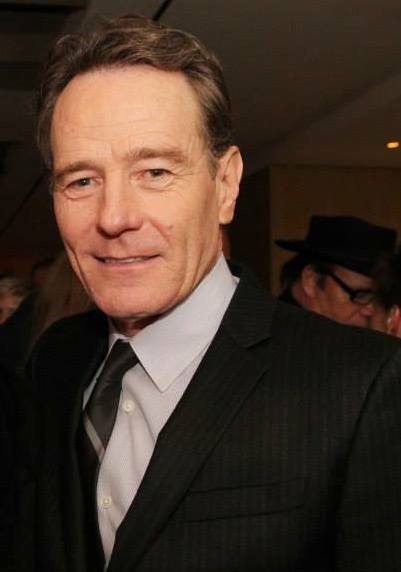 The 2014 Tony Awards, presented by The Broadway League and the American Theatre Wing, were handed out at Radio City Music Hall on Sunday, June 8, 2014, with Hugh Jackman as host. 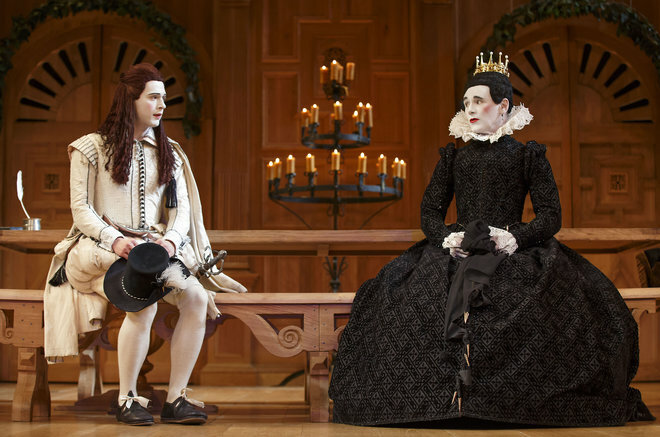 A Gentleman’s Guide to Love and Murder garnered four Tonys including Best Musical, Best Book of a Musical for Robert L. Freedman, Best Costume Design of a Musical for Linda Cho, and Best Direction of a Musical for Darko Tresnjak. 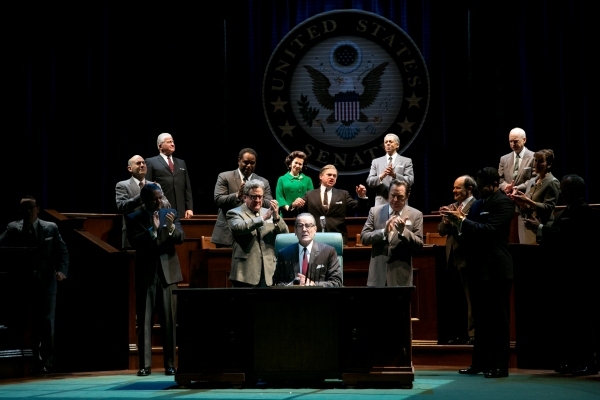 Robert Schenkkan’s All the Way nabbed two for Best Play, while Bryan Cranston took home his first Tony for Best Performance by an Actor in a Leading Role in a Play. 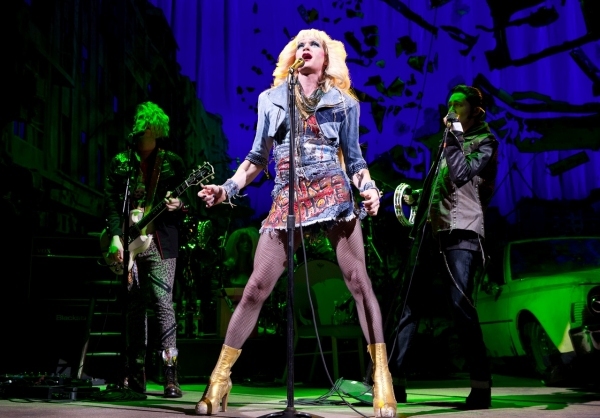 Hedwig and the Angry Inch took home four Tonys including Best Revival of a Musical, Best Performance by an Actor in a Leading Role in a Musical for Neil Patrick Harris, Best Performance by an Actress in a Featured Role in a Musical for Lena Hall, and Best Lighting Design of a Musical for Kevin Adams. 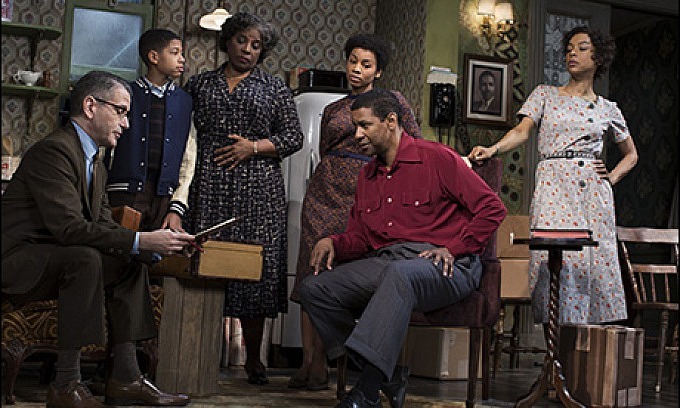 Lorraine Hansberry’s A Raisin in the Sun won three Tonys including Best Revival of Play, Best Performance by an Actress in a Featured Role in a Play for Sophie Okonedo, and Best Direction of a Play for Kenny Leon. 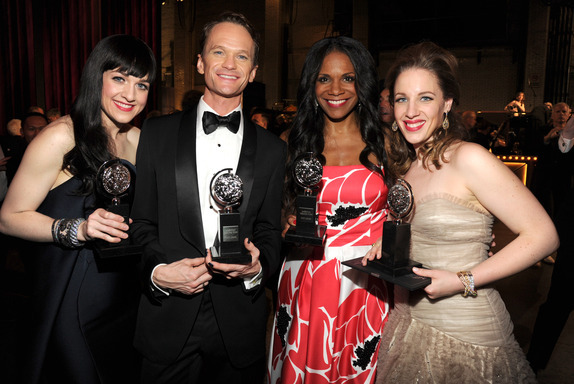 Audra McDonald made history with her sixth Tony for Best Performance by an Actress in a Leading Role in a Play for her uncanny portrayal of Billie Holiday in Lanie Robertson’s musical play Lady Day at Emerson’s Bar & Grill. 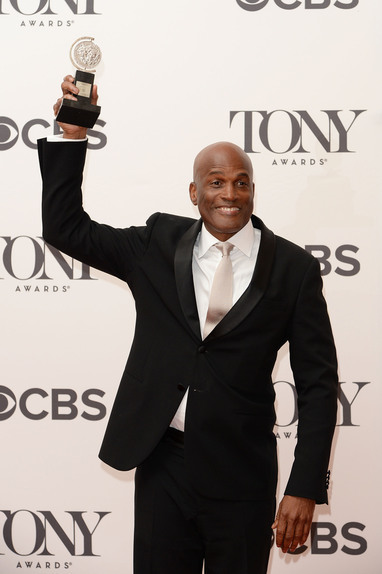 McDonald’s other Tonys include Best Featured Actress in a Play (A Raisin in the Sun and Master Class), Best Lead Actress in a Musical (The Gershwins’ Porgy and Bess) and Best Featured Actress in a Musical (Ragtime and Carousel). 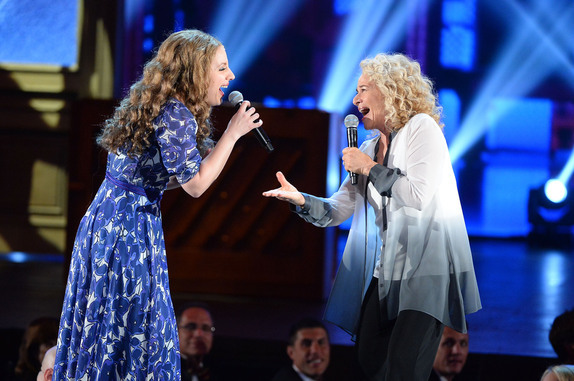 Jessie Mueller won her first Tony for Best Performance by an Actress in a Leading Role in a Musical for Beautiful – The Carol King Musical; Mark Rylance received his third Tony for Best Performance by an Actor in a Featured Role in a Play for his turn as Olivia in Twelfth Night ; and James Monroe Iglehart won a Best Performance by an Actor in a Featured Role in a Musical Tony for his Genie in Aladdin. 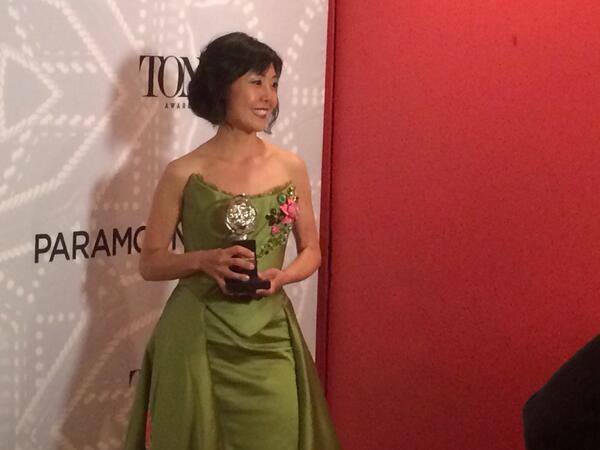 Below is the full list of 2014 Tony Winners. Congrats to all. 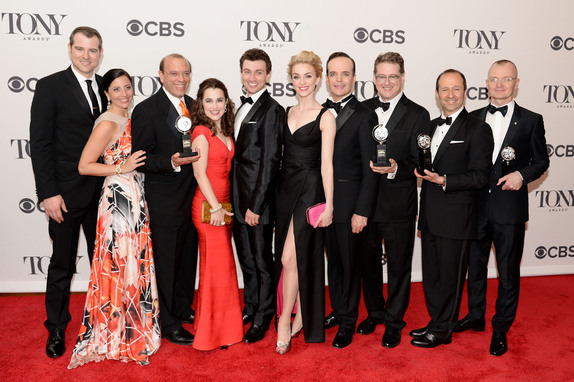 The Cast and crew of “A Gentleman’s Guide to Love and Murder” poses in the press room during the 68th Annual Tony Awards on June 8, 2014 in New York City. 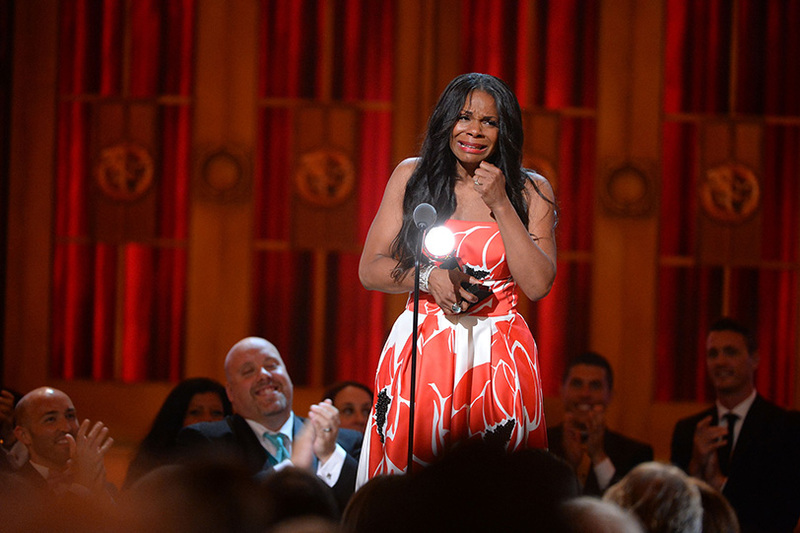 Tony Award winner Audra McDonald accepts the award for Best Performance by an Actress in a Leading Role in a Play for ‘Lady Day at Emerson’s Bar & Grill’ onstage during the 2014 Tony Awards. 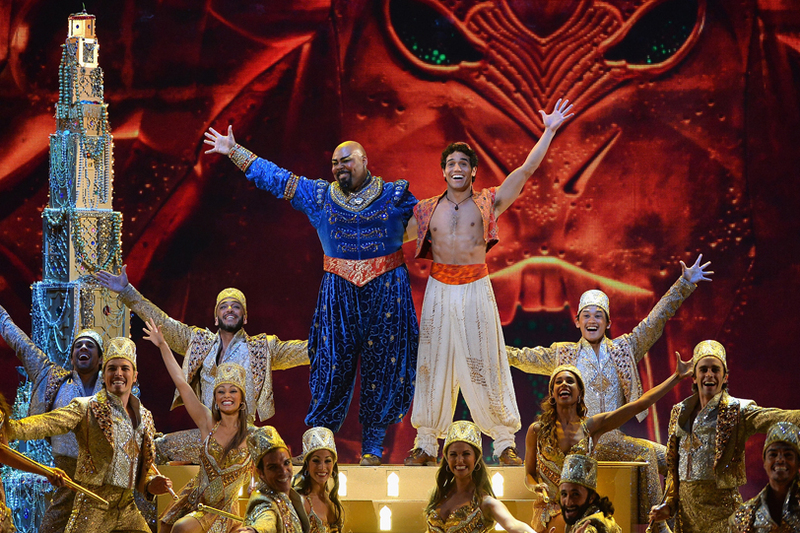 Tony winner James Monroe Iglehart and the cast of ‘Aladdin’ performing at the 2014 Tony Awards. 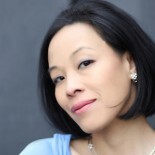 This entry was posted on June 9, 2014 by Lia Chang in African American Artists, Awards, Entertainment, Events, New York, Theater and tagged #TonyAwards, #TonyAwards2014, A Gentleman's Guide to Love & Murder, A Raisin in the Sun, Act One, After Midnight, Aladdin, All The Way, American Theatre Wing, Audra McDonald, “Lady Day at Emerson’s Bar & Grill”, Backstage Pass with Lia Chang Best Play Author: Robert Schenkkan, Beautiful - The Carole King Musical, Beowulf Boritt, Best Book of a Musical, Best Choreography, Best Costume Design of a Musical, Best Costume Design of a Play, Best Direction of a Musical, Best Direction of a Play, Best Lighting Design of a Musical, Best Lighting Design of a Play, Best Musical, Best Orchestrations, Best Original Score (Music and/or Lyrics) Written for the Theatre, Best Performance by an Actor in a Featured Role in a Musical, Best Performance by an Actor in a Featured Role in a Play, Best Performance by an Actor in a Leading Role in a Musical, Best Performance by an Actor in a Leading Role in a Play, Best Performance by an Actress in a Featured Role in a Musical, Best Performance by an Actress in a Featured Role in a Play, Best Performance by an Actress in a Leading Role in a Musical, Best Performance by an Actress in a Leading Role in a Play, Best Revival of a Play, Best Scenic Design of a Musical, Best Scenic Design of a Play, Best Sound Design of a Musical, Best Sound Design of a Play, Bradley Cooper, Brian Ronan, Bryan Cranston, Charlotte Wilcox, Christopher Barreca, Daniel Radcliff, Darko Tresnjak, Fantasia Barrino, Gladys Knight, Hedwig and the Angry Inch, Hugh Jackman, Isabelle Stevenson Award, James Monroe Iglehart, Jane Greenwood, Jason Robert Brown, Jenny Tiramani, Jessie Mueller, Joan Marcus, Joseph P. Benincasa, Kenny Leon, Kevin Adams, Lena Hall, Lia Chang, Linda Cho, Lucy Liu, Mark Rylance, Natasha Katz, Neil Patrick Harris, Patrick Wilson, Patti Labelle, Radio City Music Hall, Regional Theatre Tony Award, Robert L. Freedman, Rocky, Rosie O’Donnell, Samuel L. Jackson, Signature Theatre, Sophie Okonedo, Steve Canyon Kennedy, The 2014 Tony Awards The Broadway League and the American Theatre Wing, The Bridges of Madison County, The Bridges of Madison County Special Tony Award for Lifetime Achievement in the Theatre, The Broadway League, The Glass Menagerie, Tony Honors for Excellence in the Theatre, Twelfth Night, Vera Farmiga, Warren Carlyle.